There are a number of online casinos today that are known for their excellent game range, fast payouts, cool promotions, and great customer support, and one these is the Cool Cat casino. This casino is part of the Virtual Casino Group, a group of online casino groups based out of Costa Rica. The Cool Cat casino has a great look and feel. The stylization and presentation ensures the content gets your attention the moment you reach the casino’s home page. The dashing blue background contrasting against the bright and stunning graphics works wonders with the casino’s looks. The Cool Cat casino’s colorful looks are just half the story; one of the aspects that keeps the customer at the casino once he has registered an account is the superb interface. The layout is brilliant in its simplicity, and that matters a lot when you are looking to attract payers to your tables. All the important buttons are present right on the home page, which means navigation is easy and efficient. 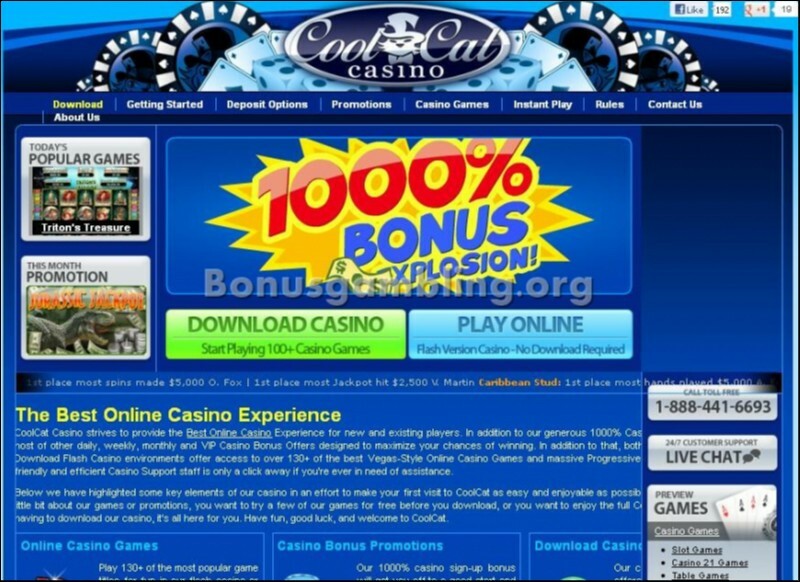 The Cool Cat Casino is powered by software from Real Time Gaming, which provides the casino with the great looks and interface and also a number of other cutting edge features. Real Time Gaming is known in the industry as one of the best in online gambling software development, and this comes through totally in the Cool Cat Casino. The casino software is available in two different modes – Download and Instant Play. The casino is not compatible with Macintosh systems, but works well with all systems running on the Windows platform. Some of the smart features that the RTG software provides Cool Cat casino with include fast downloads, multi-table play, the ability to check hand histories, smooth gaming, and much more. Besides, it also provides the players with a choice of over 100 different games. The games available include slots, video poker, blackjack, roulette, baccarat, craps, specialty games, and others. The Cool Cat casino uses state of the art security to provide you with a completely secure and safe gaming environment. It uses 128-bit SSL technology to ensure no malicious elements are able to tamper with your personal data and your transactions. Besides, the random number generator (RNG) it uses bears a certificate for randomness from Technical Systems Testing (TST), an independent testing and certification agency. The Cool Cat casino is licensed by the government of Costa Rica and accepts players from the USA.